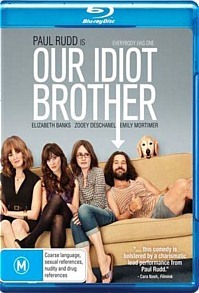 Our Idiot Brother Blu-ray Our Idiot Brother never really takes off, and though it tries its darndest is perhaps in the end simply too dumb to be truly heartfelt. Biodynamic farmer Ned (Paul Rudd, I Love You Man) lives an idyllic life with his girlfriend Janet. Arrested one day at an organic market for selling weed to a police officer, Ned returns from a seemingly unrealistically lengthy prison term to find his hippie girlfriend has shacked up with another fellow. Informed by Janet’s new lover that he may be able to rent the farm’s goat barn if he can muster the requisite funds, Ned then sets about the task with the kind of diligence that only a 35-year-old stoner can muster, though he seems more excited about being in proximity to his dog Willie Nelson than he does to his dreadlocked twit of an ex (Kathryn Hahn, who has performed brilliantly in such comedic fare as Step Brothers, but seems unable to find her footing here). If the plot so far sounds like a load of old toss and a waste of Rudd’s substantial comedic talents, that’s because it is. Thankfully however the story derives its impetus from Ned’s relationship with his three wildly dissimilar sisters; struggling freelance journalist Miranda (Elizabeth Banks), bisexual hipster Natalie (Zooey Deschanel, naturally) and Liz (Emily Mortimer), the latter of whom is trapped in a marriage both loveless and sexless to documentary filmmaker Dylan (Steve Coogan). In addition to sorting out his own life the good-natured Ned must also try, in his own bumbling way, to instil some harmony into the lives of his dysfunctional family members, an approach which mainly ends in disaster and with him being considered, as the title suggests, something of a dimwit by the family members he is trying to help. In spite of Rudd’s best efforts and a formidable supporting cast, which also includes Rashida Jones (The Office, Parks and Recreation) and Hugh ‘Mr Claire Danes’ Dancy, Our Idiot Brother never really takes off, and though it tries its darndest is perhaps in the end simply too dumb to be truly heartfelt.